It's been five days in the Big Apple and although I got nickeled and dimed to death by the experts of Manahattan, I had a wonderful time. I saw four Broadway shows: "Follies", "Sons of the Prophet", "Venus in Fur", and "The Mountaintop". I will only talk about "Follies" in this post. I'll write something about each of the others over the next few days. "Follies", is in a word, sublime. If you are heading to New York anytime soon, and if you have an eclectic appreciation for musical theatre then you owe it to yourself to see this show. However, if you rarely go to the theatre, then go see another musical. I recommend "Jersey Boys". Anyway, back to "Follies". I just can't say enough about how magnificent this show is in every way. 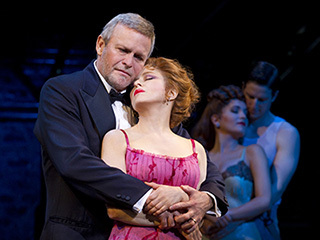 The very predictable highlight of the show for me was the performance by the goddess of musical theatre, Miss Bernadette Peters as Sally Durante Plummer. I have loved this small bundle of artIstic genius since watching her appear on Sesame Street when I was a kid. The thing I love about her most is that you just never feel that she's acting. She seems to actually completely live each and every moment on stage as her own personal reality. She sends chills down my spine and gives me goose bumps. Since I'm blogging and not writing a review, here's a little story that's kind of fun. I was having lunch with a friend at 5 Napkins. We were discussing "Follies" and how wonderful it was. As we were speaking Jan Maxwell herself, who is fabulous in the show as Phyllis, was walking down the street toward our outdoor table. Like an idiot I pointed directly at her and said in too loud a voice, "there she is!". Poor Jan's face instantly became a mask of terror, and I felt instantly ridiculous. Quickly, I saved myself by giving her a thumbs up and whispering to her, "great show", attempting also to don the most gentle, non-stalker expression I could muster. It must have worked because she relaxed and realized that I wasn't going to cause her an episode of celebrity hell. She smiled thankfully and said "yes it is". It was a very funny moment. Anyway, just go see this show, and if you see it and can tell me how the hell they were able to create the otherworldly lighting effects, let me know, because it was magical and I have no idea how they did it. It closes on January 21st, so buy your plane tickets now.